“Excuse me, excuse me, excuse me!” calls out the carretillero as he weaves skillfully through the shoulder-to-shoulder crowd clogging the Gamarra textile district. Carretilleros — Spanish for cart-pushers — are ubiquitous in Gamarra, hauling bundles of clothing from stand to stand, acting as the connective tissue that holds together the neighborhood’s segmented manufacturing process. Gamarra is Latin America’s largest textile district, home to some 90,000 workers and around $1.3 billion USD yearly transactions. In a previous post, I looked into the neighborhood’s astounding growth and hyper-specialized lines of production. 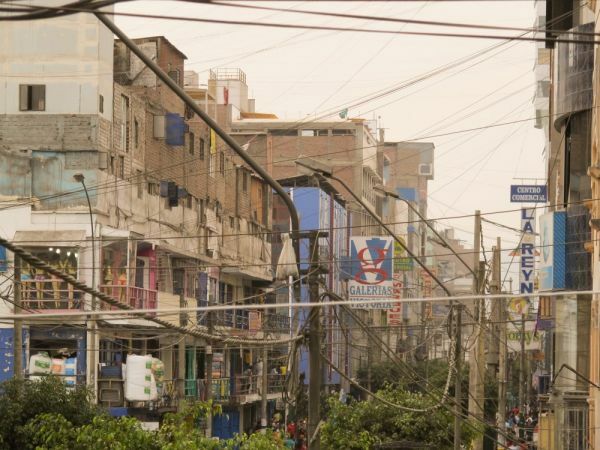 But those lines are actually more of a web, spread out over 24 square blocks in the district of La Victoria. 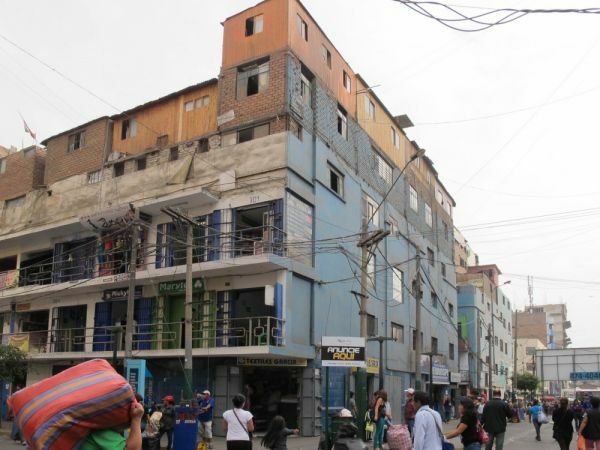 The intense demand for manufacturing and retail space has left Gamarra with the most expensive real estate Peru, around $10,000 USD per square meter. Faced with such exorbitant prices and precious little land, entrepreneurs have turned to informal construction as a cheaper and quicker — but not always safer – way of building up fast. After the collapse of an eight-story apparel factory in Bangladesh left 1,127 people dead, local Peruvian media and district officials started to draw parallels between that tragedy and the situation in Gamarra. 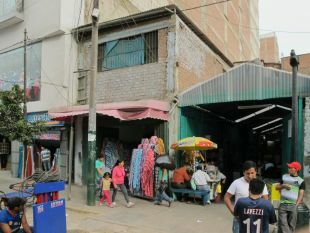 In an interview with local magazine Caretas, La Victoria’s Mayor Alberto Sánchez warned of the dangers of Gamarra’s informally constructed buildings and workshops. 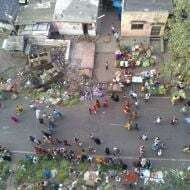 “We haven’t reached the extremes of Bangladesh,” said Sánchez, “but overcrowding is high, there is very large informality, and salaries are low.” He estimated that between 70 and 80 percent of Gamarra’s construction is informal. I recently returned to Gamarra to see this for myself, and if you’re looking for it, it’s easy to spot where the formal and informal construction dovetails. Exposed red brick walls and mismatched paint stand out. Rooftop wooden sheds sit dangerously close to the edges of five-story cement buildings — an unnerving sight in earthquake-prone Peru. Seen from above, the group of prefabricated wooden boxes resemble a tiny version of a pueblo joven. I meet up with Veronica, the Gamarra entrepreneur who gave me a tour of the district during my last visit, and she tells about the informal construction in the area. As we walk down one of its side streets, she points to a row of buildings, telling me they were all residential homes when she first arrived in the district in 2001. 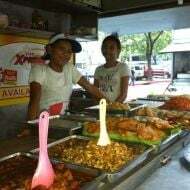 “Now they are informal businesses and restaurants,” she says. Looking at the different layers of construction is like looking back through the eras of Gamarra’s growth: The small workshops that started to appear in the district in the 1960s, the large shopping centers that were established in the early ’70s, and the multi-storied buildings with escalators, which didn’t really start to spring up until the past couple of decades. The district’s highly segmented business model means new stands are built wherever they’re needed, cutting the cost and time necessary to transport merchandise between stands. What were once single-story family homes are now two- or three-story structures wedged between modern glass high-rises. Many shops avoid electrical bills by getting illegal connections, Veronica tells me. Outside a grime-covered yellowish building, at least a dozen electrical cables are intertwined in what looks like a knot that will never be undone. Safety conditions in the district used to be worse, she says. 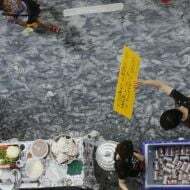 “Now Civil Defense officials pressure the shopping centers to clean up. Before you couldn’t walk, because every stand invaded the hallway.” But increased oversight can only do so much when a bribe takes care of most building-code breaches. “For example, this shopping gallery over here, when Civil Defense comes to inspect, the administrator pays them, as a bribe,” she says. For Mayor Sánchez the fight against informal construction is hindered by legal gray areas that protect the buildings that were once constructed as housing. 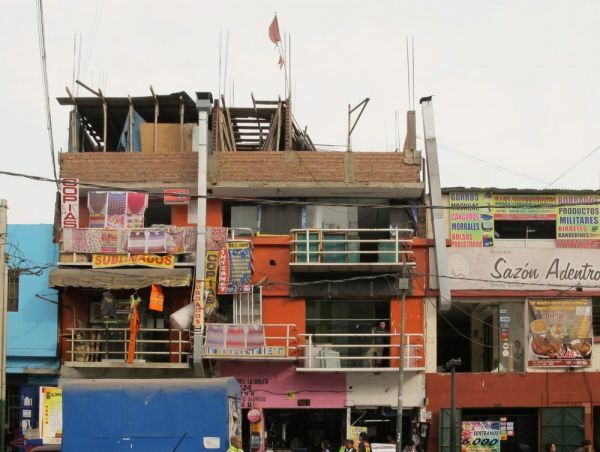 “These are home-workshops,” Sánchez told Caretas, explaining that originally Gamarra’s zoning laws allowed for construction of five-story residential homes, which were later legally converted to multipurpose buildings. “In reality they function as semi-legal workshops, with one guard [living there] to say that it is housing,” the mayor said. 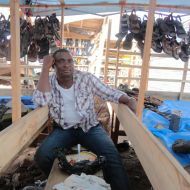 The district, he said, is not able to shut down the informal workshops since technically they’re still homes. 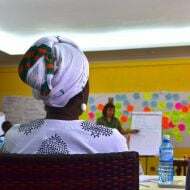 Veronica says that the improvised structures are the result of people looking to grow their businesses and get as much use as they can from their surroundings. The general sentiment among Gamarra’s workers, Veronica says, is that they own the space, and should be free to do what they want with it.